CHG are highly professional and innovative in their way of working and a reliable source of insight into the complexities of the current rental market…. 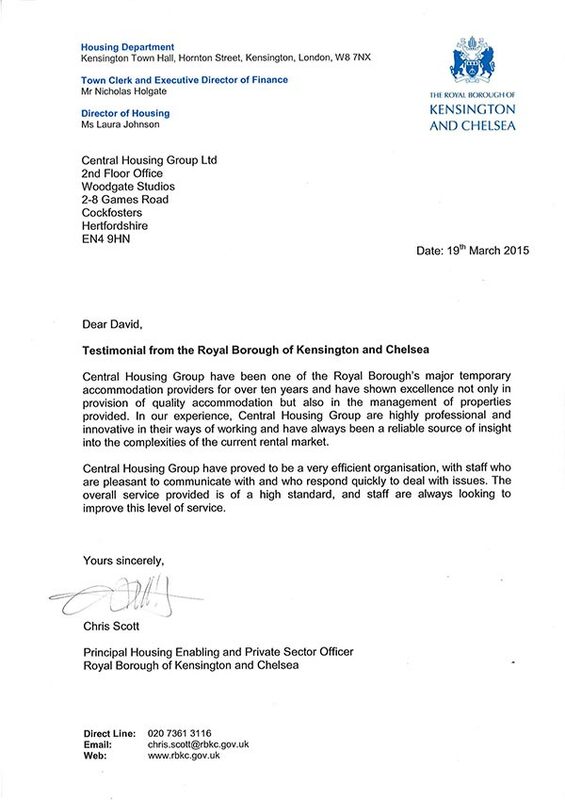 Central Housing Group have been one of the Royal Borough’s major temporary accommodation providers for over ten years and have shown excellence not only in provision of quality temporary accommodation but also in the management of properties provided. In our experience, Central Housing Group are highly professional and innovative in their ways of working and have always been a reliable source of insight into the complexities of the current rental market. Central Housing Group have proved to be a very efficient organisation, with staff who are pleasant to communicate with and who respond quickly to deal with issues. The overall service provided is of a high standard, and staff are always lokking to improve this level of service. When you employ Central Housing Group as your letting agent, you are putting your property in the hands of a trusted, well-established and award-winning letting agency. We are London’s ‘Guaranteed Rent’ specialists and we offer you the most reliable way to let your property. When you rent your property to a Council through us, you are guaranteed rent for your property for up to five years. We remove all the stress and hassle of renting your property with our ‘Guaranteed Rent’ scheme – just sit back and receive your rent each month. We have a dedicated property management team who will deal with any maintenance, management and tenant issues.